Anaconda Enterprise enables you to specify NFS shares that platform users can use to store data and source code, that they can access within sessions and deployments. You can add an NFS share to Anaconda Enterprise by editing the platform’s Config map. The NFS share is mounted using the anaconda service account on the Anaconda Enterprise server. To mount the share as writable, configure the NFS server so that the anaconda user account (UID 1000, by default) has write permissions. 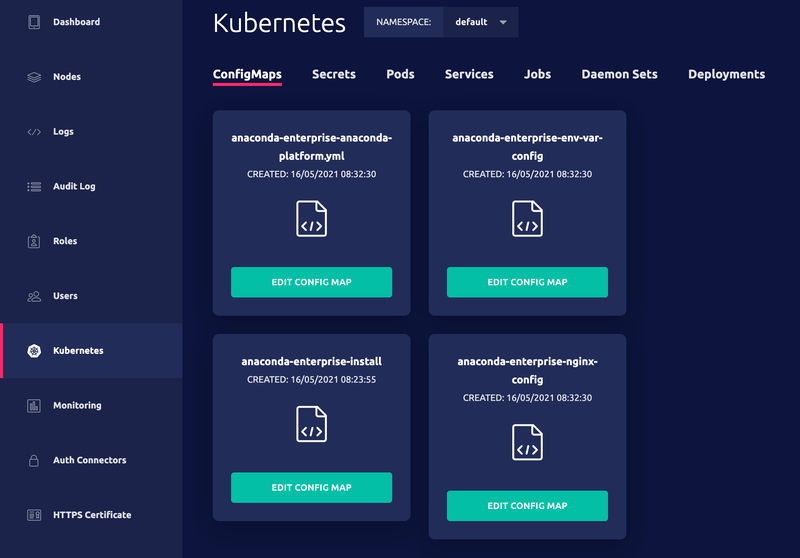 You’ll be editing the Anaconda Enterprise Config map directly, so we recommend you back up the current version of anaconda-enterprise-anaconda-platform.yml before making changes to it. Log in to Anaconda Enterprise, select the Menu icon in the top right corner and click the Administrative Console link displayed at the bottom of the slide out window. Log in to the Operations Center using the Administrator credentials configured after installation. Select Configuration from the menu on the left. Use the Config map drop-down menu to select the anaconda-enterprise-anaconda-platform.yml configuration file. …and you want to mount them as /data/nfs-small (read-only) and /data/nfs-large (read-write). Only lowercase alphanumeric characters and - dashes are allowed in volume names. Click Apply to save your changes to the Config map. To verify that Anaconda Enterprise users can access any NFS volumes you add, stop and restart a project editor session and confirm that the volumes are listed as available directories. See Loading data for more information. If an NFS server that you have configured as a volume mount in Anaconda Enterprise goes offline, editor sessions, applications and deployment jobs that use it will not start. If NFS downtime occurs, we recommend disabling the mount until the NFS server resumes proper functioning. Open the Config map and comment out the volume section. Restart all services as described above. Anaconda Enterprise 5 documentation version 5.3.0.